Need more apps for your favorite device? iOSnoops can help! Here are 57 iPhone, iPad and iPod touch apps that have just gone free. 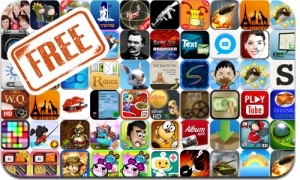 This apps gone free alert includes Bouncy Mouse, Tiny Jump, Drop The Chicken, Run For Peace, Penguin Wings 1 & 2, Word Grind, Mole Kingdom, Toca Doctor, Beat the Beast, Makanim, and many others.